Excitement continues to build for Pacific Pt., Bosa Development‘s 28-storey condo tower in Yaletown. Last weekend, over 600 people showed up to the VIP opening event, heaping praise on the spacious homes and three display suites. 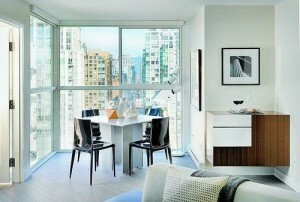 Nestled in a quiet and walkable enclave of Yaletown, Pacific Pt. stands adjacent to David Lam Park and boasts stunning views of False Creek, English Bay and downtown Vancouver. The 28-storey tower is comprised of 214 homes that range in size from 450 to 1,680-square-feet. One bedroom plus den homes start from the low $400,000’s, junior two-bedroom plus den homes are priced from the low $500,000s and two-bedroom plus den homes from the low $600,000s. Speaking to the Vancouver Sun last week, Bosa Development president Nat Bosa says he never hesitated to tackle the Pacific Pt. refurbishment project. Bosa goes on to tell the paper that because the 21-year-old building had been so well-built and well-maintained, there was no need to replace it. Still, that doesn’t mean the developer didn’t put a lot of work into ensuring the building was up to Bosa Development‘s high standards. Most of the windows, water pipes and electrical systems were replaced. The unique interiors were all renovated and reconfigured. “Because of the building’s pentagon shape with numerous indentations, there are views in all directions through floor-to-ceiling windows; almost every suite has a solarium,” the Sun goes on to point out. If you’d like to see the Pacific Pt. homes for yourself, you can schedule a private viewing appointment by calling 604 685 0855.